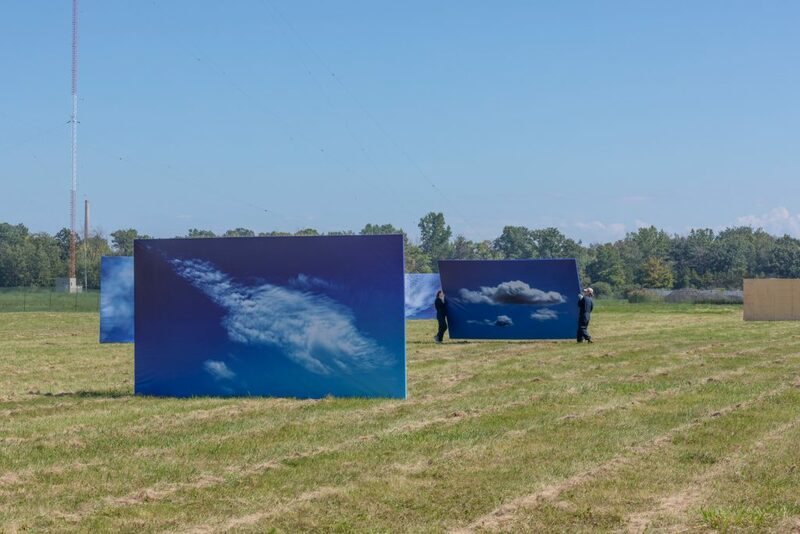 Paul Walde, Of Weather (for Geoff Hendricks), 2018. Commissioned by Blackwood Gallery for The Work of Wind: Air, Land, Sea. Photo: Spiral Mountains Media. Courtesy Blackwood Gallery. 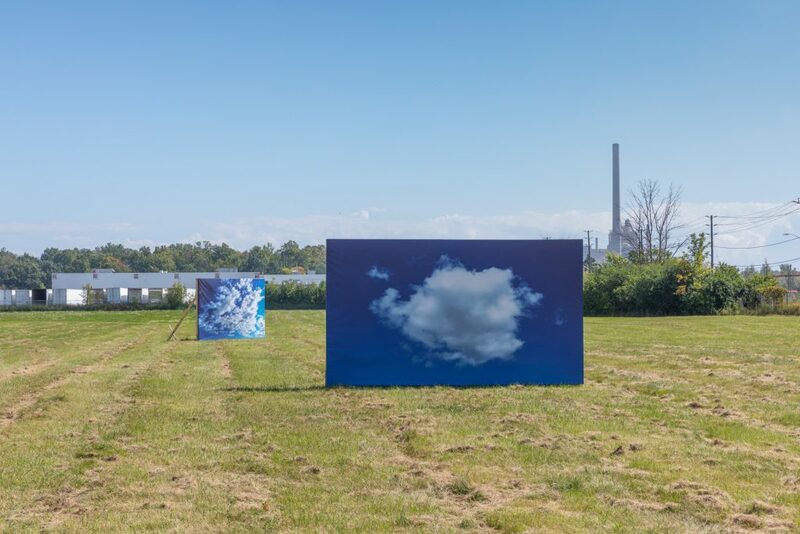 Paul Walde, Of Weather (for Geoff Hendricks), 2018. Commissioned by Blackwood Gallery for The Work of Wind: Air, Land, Sea. Photo: Toni Hafkenscheid. Courtesy Blackwood Gallery. 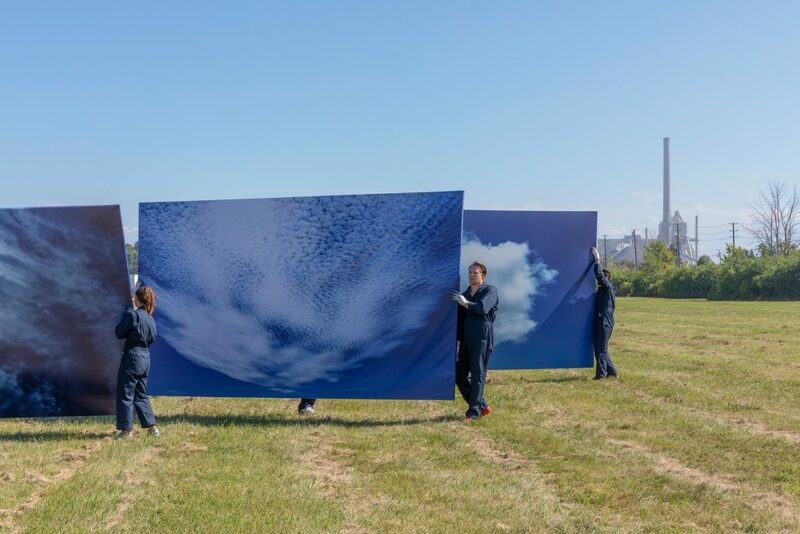 Of Weather (for Geoff Hendricks) is the first of a proposed series of performances called Moving Image Works, where images of clouds are brought down to ground-level as large-scale stretched photographic prints. 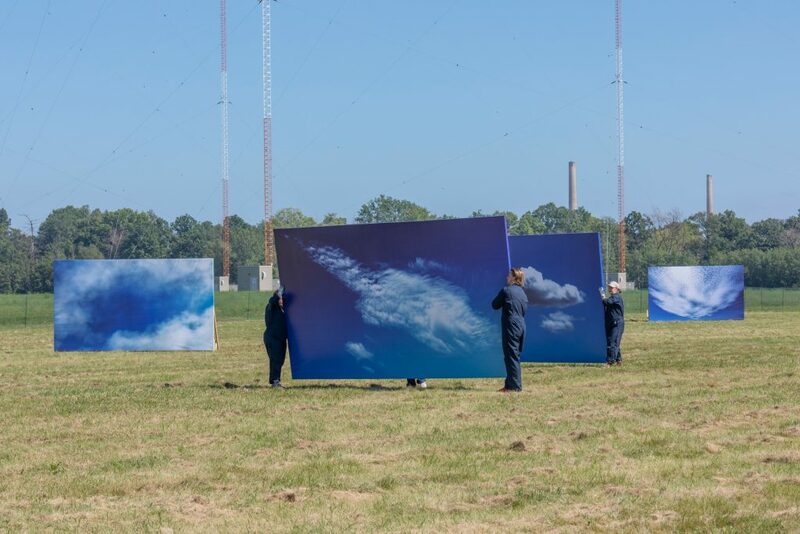 The clouds are animated by teams of handlers who move through the Southdown Industrial Area, responding to changes in the weather over the course of ten days. 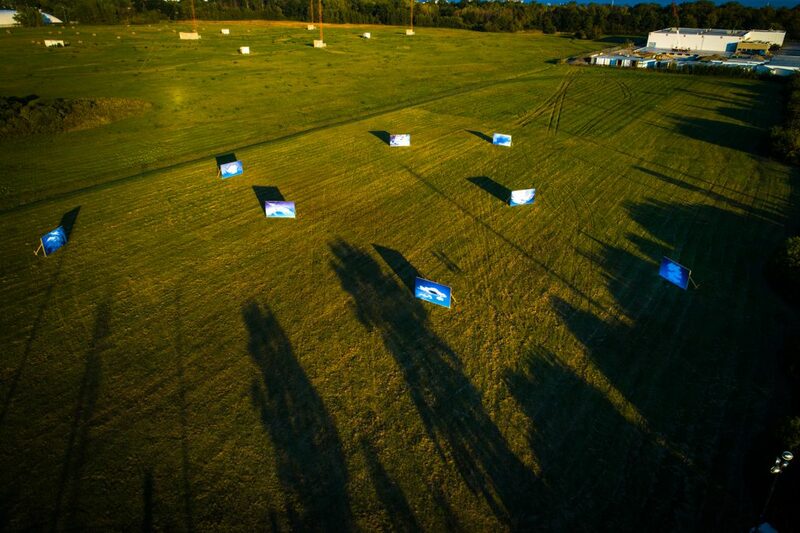 At prescribed intervals during each day, the teams come together to perform a choreography of image movements. This ballet of images is built upon standard filmmaking camera movements and editing techniques including pans, zooms, tilts, wipes, and cuts. 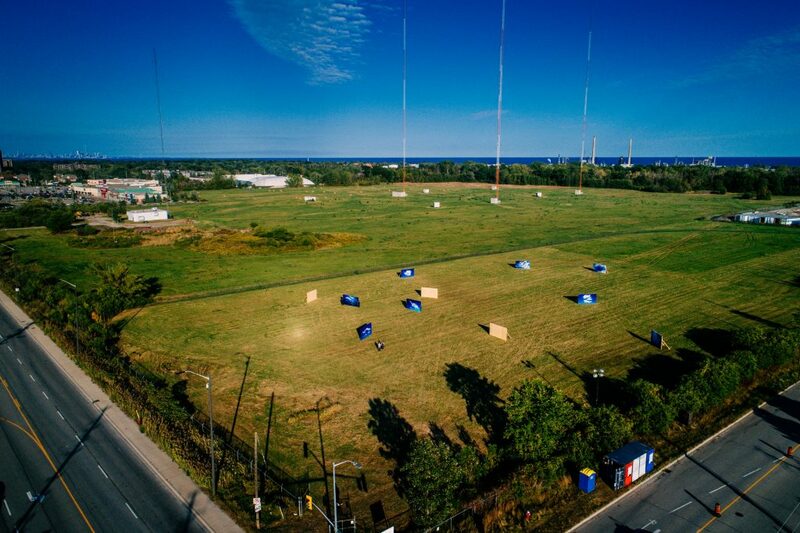 When not roaming the exhibition area, the images form a photographic installation in a radio transmission field. 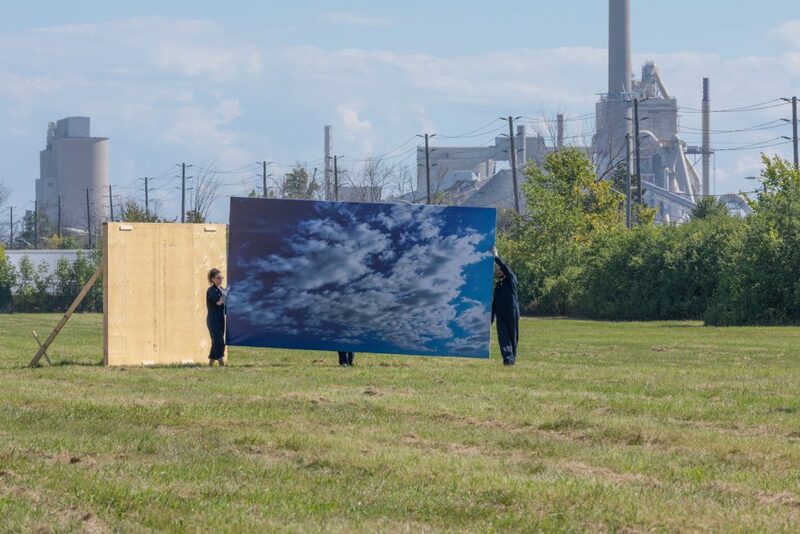 Paul Walde is an artist, composer, and curator. 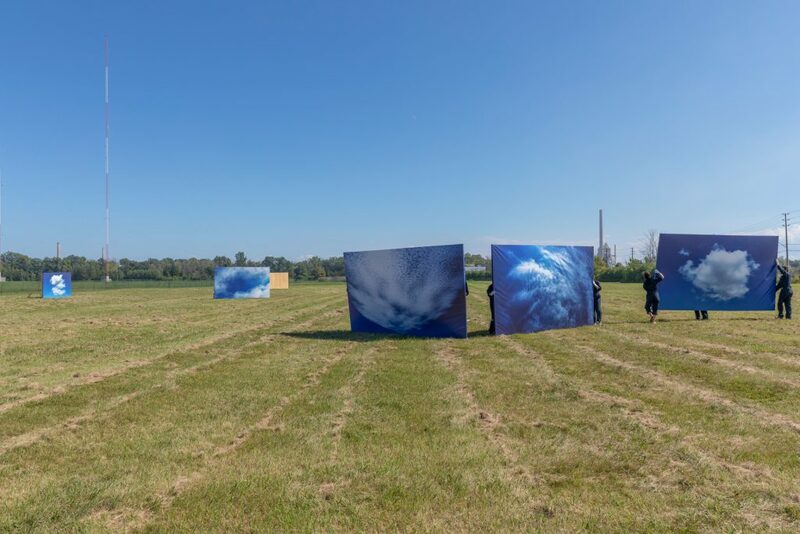 Walde’s body of work suggests unexpected interconnections between landscape, identity, and technology. Recent exhibitions of his work include: Au Loin Une Île at Mains d’OEuvres in Paris (2018), Records and Wireframes at Dundee Contemporary Arts as part of the NEoN Festival of Digital Media in Dundee, Scotland (2017) and The View from Up Here at the Anchorage Museum and the Nordnorsk Kunstmuseum in Tromsø, Norway (2016 and 2017). Walde is an Associate Professor and Chair of the Department of Visual Arts at the University of Victoria in Victoria, BC. Radio Transmission Field, Avonhead Rd. & Royal Windsor Dr.